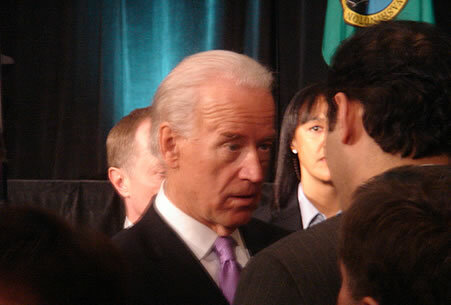 Vice President Joe Biden visited Seattle this morning for a breakfast gathering at the Westin Hotel. He took the stage alongside United States Senator Patty Murray to reflect on the past year and look ahead to 2010. While the Vice President discussed healthcare reform briefly, his main topics were economic issues: mainly the administration’s efforts to avert collapse of the global financial system early last year and their current focus on jobs and economic development. If Mr. Biden knew the administration’s plans for healthcare reform, he wasn’t talking, except to say that it, along with leadership on the environment and green technologies were vital to support economic security for middle class Americans. Back when Governor Tim Kaine visited Seattle for a much smaller gathering, healthcare legislation was actively moving through Congress and the Governor expressed optimism that President Obama would be listing it as an accomplishment at his State of the Union address. The one speaker at this morning’s event to chart a course for healthcare reform was Representative Jay Inslee who stated emphatically that the bills passed by the House and Senate late last year would reach the President’s desk via reconciliation with a simple majority vote. He challenged the newly minted senator from Massachusetts, who won his seat with 52% of the vote, to insist upon a 60% vote in the Senate to pass reform. I should note that Democratic members of the House tend to speak more boldly about modifying rules and traditions of the Senate than do the senators themselves. But time will tell. As you would imagine, security was tight at the event. At the entrance, I was wanded in ways I have never been wanded before. 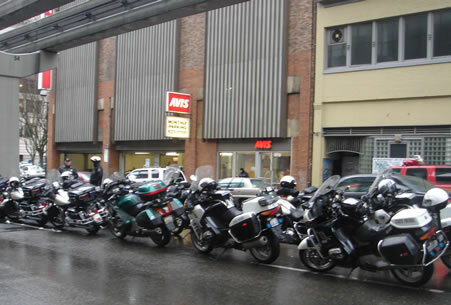 Here’s a snapshot of police motorcycles lined up under the Monorail preparing to lead the Vice President’s motorcade back to Boeing Field.